Griswold Coil Piping Packages are pre-assembled piping systems that save time and reduce cost. We offer fully assembled coil hook ups that can be readily connected to your system with as little as 4 connections. No more field assembled components, we do it all for you. Griswold Controls offers over 900 standard configurations that can be shipped in as little as 48 hours from order receipt from your Griswold Controls Representative. Griswold Coil Piping Packages (CPP’s) may include Flow Control Valves, Isolators, ball valves, unions, Y-Strainers, temperature control valves, stainless steel hoses, insulated hoses, air vents, pressure/temperature test valves, and drain valves. Supply-Side: Isolator S with pressure/temperature test valve and drain valve. Includes integral strainer and ball valve. Return-Side: Isolator R with 2 pressure/temperature test valve and manual air vent. Choice of end piece connections. (2 way & 3 way packages include Isolator Union with manual air vent). Supply-Side: Isolator Y with pressure/temperature test valves, drain valve and choice of union end piece. Return-Side: Isolator B with air vent and pressure/temperature test valve. Choice of end piece connections. (2 way & 3 way packages include Isolator Union with manual air vent). Return-Side: QuickSet® or QuickDisc® Manual Balancing Valve with 2 pressure/temperature test valves, memory stop, optimizer and venturi. Choice of end piece connections. (2 way & 3 way packages include Isolator Union with manual air vent). Return-Side: Automizer or PIC-V. Assembly includes universal actuator mounting plate, for your choice of actuator, supplied by Griswold or supplied by others. Choice of end piece connections. 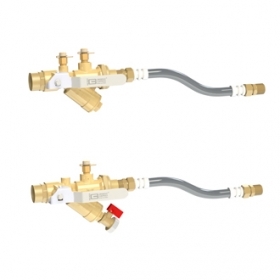 Griswold Controls Hose Kits are pre-assembled flow control packages with flame retardant stainless steel hoses. Most Hose Kits are available in sizes from 1/2″ to 2″, with hose lengths from 12 to 36 inches. Kits contain flow control valve, hoses, and isolation ball valve. Hose Kits 14 and 4 have y-strainers included in with other components.